Hawaii is a US state but also due to its distance and history remains somewhat foreign at the same time. Last week I wrote about my observations of today’s Marine Corps, having been given an exclusive tour of the Third Marine Regiment and its unique base on the northern shore of Oahu. There are two other observations of mine regarding transportation policy worth sharing with you. 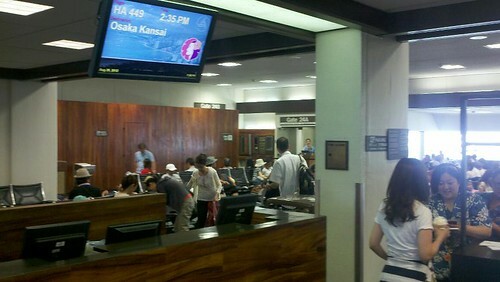 First, I flew on my favorite carrier, Hawaiian Airlines. Browsing their in-flight magazine I discovered they are aggressively adding new Asia/Pacific destinations. 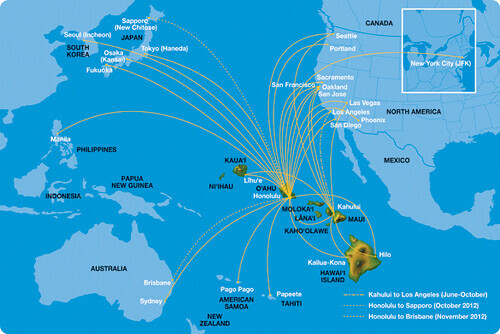 As I wrote about last fall, there is absolutely no reason for the Port of Portland to be subsidizing international flights to Asia when we have always had a premier gateway across the Pacific with Hawaiian Airlines via its Honolulu hub. 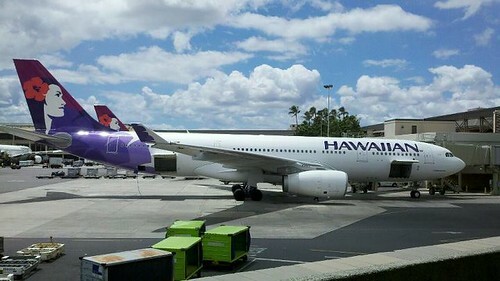 With a brief stop along the way, Hawaiian offers Portland travelers comfortable service on wide bodied aircraft to Honolulu every morning 7 days a week, which connects Portland travelers to a number of Pacific destinations. I managed to get a nice shot of one of their recently acquired A330s. This particular one was going to Osaka, one of several Japanese cities Hawaiian services beyond the usual Tokyo destination of most American carriers. Of course we’re talking about more than just multiple destinations in Japan here. With generously portioned complimentary coach meals that include free glasses of wine, you would be surprised to know for example that Hawaiian offers Oregonians the cheapest option to the Philippines, Tahiti, and American Samoa. These formerly expensive routs are now more affordable than you would think and all without subsidy. Second, Hawaii has remarkably good bus service for being so rural and sparsely populated. One of the secrets to their success is that much of this transit capacity is taken up by very affordable and reliable private, for-profit competition at no expense to Hawaiian taxpayers. They operate cute, trolley looking buses whose schedules are very adaptive to actual rider demand. This private competition with public transit stands out as such a success even on the thinly populated big island, that I had to ask the world’s leading expert on public transportation, Randal O’Toole, all about it. Yes only a geek would send out an inquiring email about transportation policy in the middle of his vacation, but I guess that’s just who I am. O’Toole tells me that Takako Satoh, the owner of one of Hawaii’s largest taxi companies, holds free market principles that prevent him from doing what his counterparts in other cities like Portland are so successful in doing, lobbying to ban private bus business. 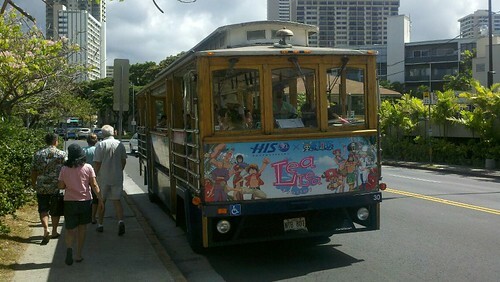 Honolulu does have a public bus system, but not a total government monopoly. The existence of private competition not only adds capacity, but it also brings out a level of quality in its public sector counterpart that the monopoly model we know in the Portland metro area cannot deliver. The ability of Hawaii to serve its most remote small towns better than TriMet serves even larger populations in Estacada and Forrest Grove is made even sweeter than a Hawaiian pineapple by the fact it does so with less tax dollars, demonstrating in vivid terms the kind of reform Portland’s regional transit needs. Honolulu is not the only city in America without a full government monopoly on bus service. O’Toole wrote an excellent paper comparing them with cities that do which you can read here. For many reasons, most things in Hawaii are far more expensive than they are Oregon. The cheapest I saw a gallon of milk for example was $5, but for some reason air transportation through Hawaii is cheaper and public transportation within Hawaii is cheaper too. In both cases, the entrepreneurship of the private sector is making this happen. They did build that.